GEERT WILDERS GIVES FULL SUPPORT TO ELISABETH IN WAKE OF AUSTRIAN SHARIA COURT VERDICT AGAINST HER…….. – The Tundra Tabloids……. 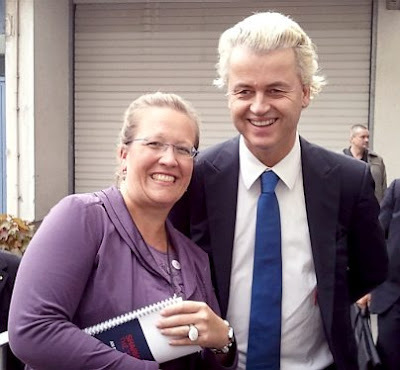 As we reported a few days ago, the new charge against Elisabeth Sabaditsch-Wolff added by the judge has made it necessary to re-activate Elisabeth’s Voice, the fund-raising initiative that will help Elisabeth meet her legal fees.Now Geert Wilders has come out in support of Elisabeth’s Voice. Previous Post Previous Post RAYMOND IBRAHIM: IRAQ’S CHRISTIAN COMMUNITY IS NEAR EXTINCTION……. Next Post Next Post MARK STEYN AND HUGH HEWITT ON JOHN BOEHNER’S CAVING IN TO OBAMA……..